As the market continues to show signs of topping, euphoric investors apparently now believe that it's a great time to pile into the riskiest of subprime auto loans, according to a new Wall Street Journal article. 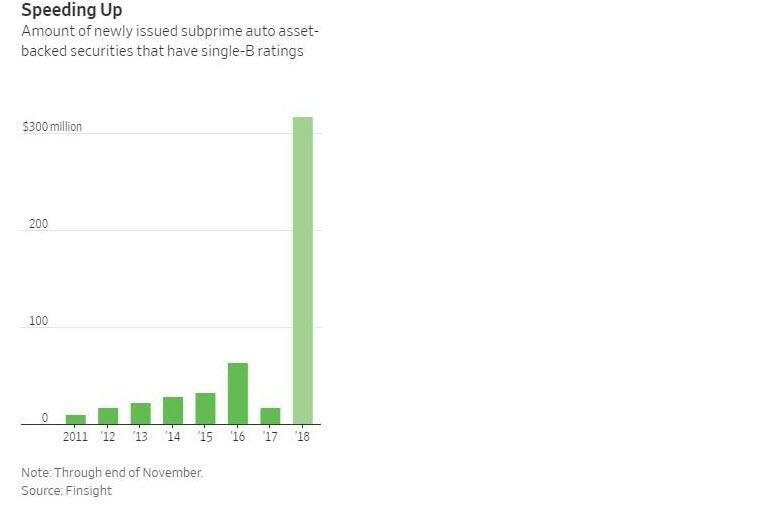 Investors this year have been buying record amounts of subprime auto securitization deals that have single-B credit rating components to them. These are deals that are easily considered to be "junk" and are "the lowest grade offered when such bonds are sold". According to data from Finsight, lenders have already issued $318 million in single-B rated debt in 2018, which is more than "all prior years combined". The appeal of these deals is the high yield, which comes as a result of the additional risk that investors bear with loans to borrowers who have FICO scores below the mid 600 level. These deals are layered with different tiers, each with a different level of risk and return based on how and when they receive payments. Single B tranches are generally the last in line for bondholders, which sometimes result in these deals paying rates of more than 6%, or about twice what the 10-year pays. In exchange, they are the first to bear risk. But that hasn't stopped issuers from being able to find buyers that are enticed by the returns. In fact, the single B portions of these deals have sometimes even been upgraded. It's a bold bet on the health of the U.S. consumer, who by all accounts simply seems to be on his or her last leg, drowning in debt at the top of an economic cycle. Borrowers are getting slightly more creditworthy in subprime, with the average FICO score moving up from 577 to 588, according to a Fitch Ratings Report that came out in August. However, 80% of borrowers are amortizing their loans over more than five years - a term that makes them more susceptible to default. Since 2012, delinquencies of over 90 days have been trending higher for all auto loans, according to the NY Fed. Not only that, but signs of trouble in subprime continue to pop up. For instance, lender Honor Finance LLC closed its doors over the summer and some bonds backed by the firm's loans were recently downgraded to double-C. Delinquencies at Honor started rising last year, according to the article. These loans begin defaulting late last year and bondholders in the double C tranche have been bracing for losses despite Westlake Financial Services, who took over the loans, trying to "aggressively pursue borrowers" who are in the early stages of delinquency. One of the reasons that bondholders might be comfortable with subprime loans is because they performed well during the years of the financial crisis. For the most part, borrowers continued to pay their loans because they needed to get to work, even if they choose to default on things like things like their homes. And despite these cracks on the surface, subprime auto loans still show no sign of slowing down. 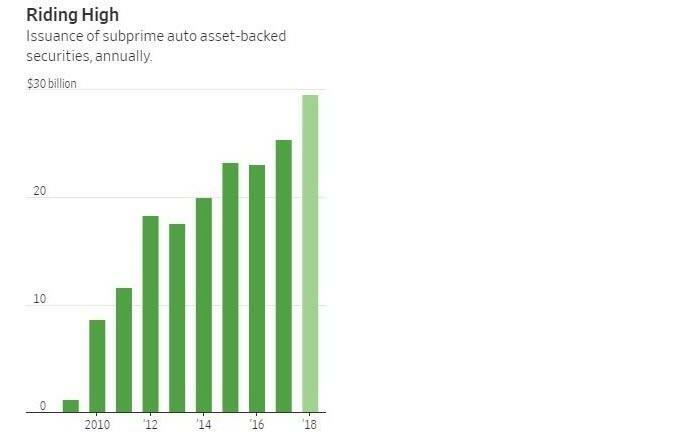 According to S&P, companies have issued about $29.7 billion of asset-backed securities made up of subprime auto loans this year, passing the former record of $24.5 billion in 2017.